Himachal Pradesh Chief Minister Jai Ram Thakur said that Himachal Pradesh would soon emerge as a model state in skill development. 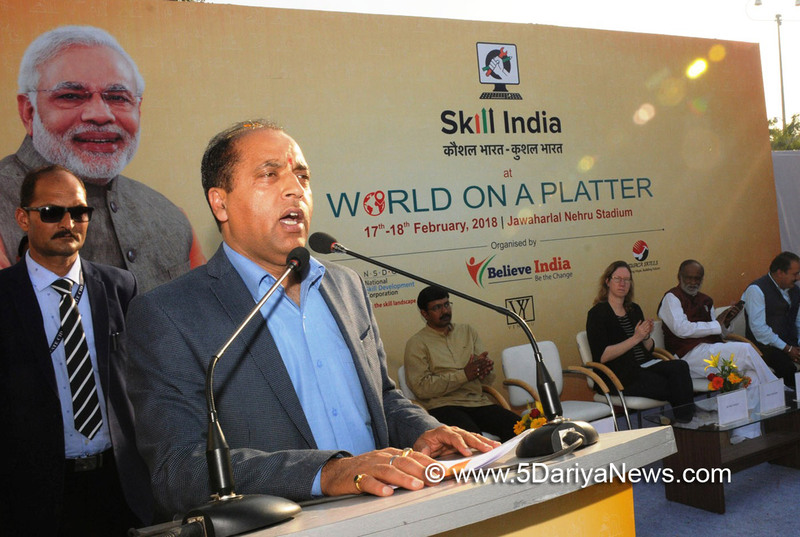 He was speaking as Chief Guest in the closing ceremony of the Skill India Pavillion at ‘World on Platter’ organized by Believe India, National Skill Development Corporation and NGO Swaca Skills in Jawaharlal Nehru Stadium at New Delhi today.Shri Jai Ram Thakur said that thrust of present Government will be on upgrading the skills of youth and to make them self reliant so that self employment avenues can open up for them which could only lead to youth empowerment. He said that government would consider to coming up with a plan under which brand product for every district would be identified and promoted under Skill India.He said that state government’s focus is on youth and in Himachal Pradesh the share of youth population is 35.25%, which is more than the national level of 34.80%. He said that Government of India has formulated the National policy for skill Development and Entrepreneurship to provide an umbrella framework to all skill development activities being carried out within the country, and to align these to common standards and link skill development activities with demand centres. On the same analogy Government of Himachal Pradesh has introduced the Skill Development Policy to guide the reform and scaling up of skill development efforts in the State. Under skill development allowance scheme, 1,85,326 persons were benefited with an amount of Rs. 156 crore, he added.Chief Minister lauded the efforts of the organizers to promote skill india initiatives during the global event which would empower skilled youth and go a long way in providing wide exposure and job opportunities to them.Chief Minister visited all the stalls set up in the pavilion and interacted with the organizers. He also visited Himachal Pradesh stall and distributed certificates to the participants.Shri Jaykant Singh Head State Engagement National Skill Development Corporation briefed about the activities of the corporation. He said that the corporation would like to work in the state on experimental basis on a project with an objective of increasing state per capita income.Shri Mallikarjun Iytha Founder of Believe India welcomed the Chief Minister.Shri Rahul Saridena Founder of Believe India proposed vote of thanks.Prominent among other dignitaries present on the occasion were Shri Sukhram Choudhry MLA and Former CPS, Shri Baldev Tomar Ex MLA, Dr K Laxman BJP Chief Telangana State, Ms. Maaya Kardoosh Deputy Ambassador Israel, Ms. Namrata Goyal Director Jet Airways.